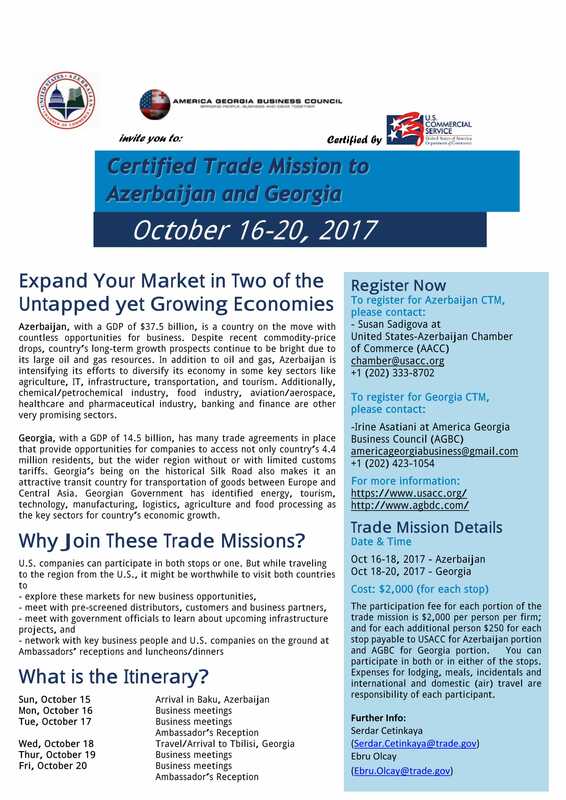 U.S. Commercial Service has certified two trade missions to the countries of Azerbaijan and Georgia that are being organized by The United States-Azerbaijan Chamber of Commerce - USACC (https://www.usacc.org) - and The America-Georgia Business Council - AGBC (http://www.agbdc.com/) out of Washington D.C. These trade missions are multi-sectoral and are open to U.S.
exporters and subsidiaries of U.S. companies that want to expand their markets in two of the untapped yet growing economies. These two missions are dated back to back so that in one week, both of the countries can be covered. As Azerbaijan and Georgia are partner posts to U.S. Commercial Service Turkey, we work with USACC and AGBC in the recruitment phase and our colleagues in U.S. Embassies Baku and Tbilisi will be arranging meetings, in these two countries, with their governments, business associations and arranging 12-15 face to face meetings for each U.S. company with potential local partners.